Most NGS analysis is founded on a very simple and powerful principle: look only at the differences of your data to a reference genome of your species. Alignment algorithms are the workhorse of this approach and accounts for the vast majority of the compute time necessary in a secondary analysis workflow. 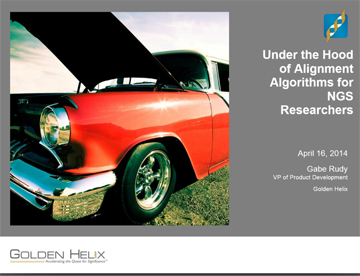 In this webcast, Gabe Rudy covers the history of alignment algorithms of short read, high-throughput sequencing data and the set of tools that represent the state of the art. We will use the newly launched GenomeBrowse 2.0 visualization engine to review examples of different alignment artifacts, false-positive variant calls, and other alignment and variant meta-data. - How all alignment algorithms are a trade-off of speed versus accuracy, and what those trade-offs can mean with your data. - How the human reference sequence causes alignment artifacts, and how you can spot them. - How BWA, BWA-MEM and BWA-SW differ. - How local re-alignment works to improve variant calling, and when you will see it and won't see it in action in your data. - How to read a CIGAR string and other per-alignment data to investigate alignments at a particular locus.